What's John Boehner Up To? In a conference call with House Republicans, Speaker John A. Boehner (R-Ohio) called for the party to unify behind a plan that he declined to detail, saying he would provide more information when lawmakers return to the Capitol Monday. But aides in both parties said they expected Boehner to press ahead with a two-stage strategy that would give the Treasury only about $1 trillion in additional borrowing authority, forcing another debt-limit battle early next year when the parties are embroiled in the heat of the 2012 presidential campaign. 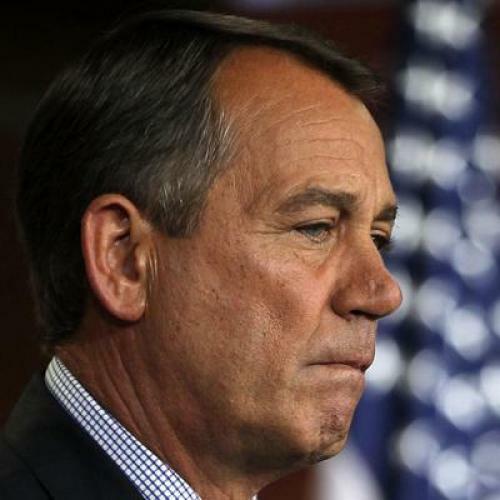 What is Boehner thinking? Here's my guess. He's got a faction that opposes raises the debt ceiling on principle unless and until President Obama has agreed to implement the entire Republican fiscal agenda. He's got another faction that's willing to cut raise the debt ceiling, but fiercely opposes any tax hike. They're willing to raise the debt ceiling without any deal -- that is, they support a version of the Mitch McConnell plan -- and they also oppose a deficit agreement that would allow President Obama to move to the center on fiscal policy. But you have a larger group that regards the McConnell plan as a sell-out. Basically, Boehner doesn't really have the votes for anything. He doesn't even have the votes for Cut, Cap and Balance, because that requires a supermajority in each house to pass a Constitutional amendment. So he's reduced to the lowest common denominator. That's a plan that only temporarily lifts the debt ceiling, pleasing the faction that opposes lifting the ceiling, avoids any tax increases, pleasing the anti-tax absolutists, and provokes a confrontation with Obama, pleasing the political hardball faction. It also positions the party as having voted to lift the debt ceiling past August 2nd, thus providing the party with an argument for laying the blame on Obama if and when dire consequences occur. How should Obama respond to this apparent move? He needs to veto it, for two reasons. First, as he's said, extending debt ceiling chaos into the election year will only worsen the crisis. And second, abandoning his one true demand would prove that he's willing to capitulate on anything at all. This would set up a second debt ceiling showdown in which Republicans would be emboldened to make even more maximalist demands. Meanwhile, Harry Reid is preparing to unveil a bill to cut $2.5 trillion from the budget, with no tax increases. That is what I think the best solution is anyway. I hope to explain more of my thinking of this soon. But the short answer is that, as long as the Bush tax cuts are unresolved and scheduled to expire, neither party is likely to agree on taxes because they don't agree on the alternative scenario. The answer is going to be to cut spending and let the elections determine whether the next step involves revenue or deeper cuts.